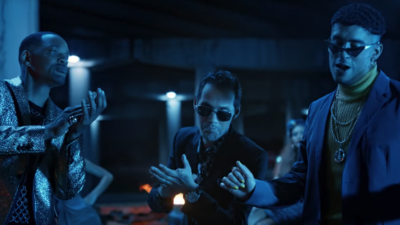 Marc Anthony, Will Smith, Bad Bunny debut "Está Rico"
Right before the song Está Rico dropped, Will Smith celebrated 50 years around the sun. The song celebrates both English and Spanish roots with this salsa trap hitter that has already racked up over 17 million views on YouTube. This isn't Smith's first time collaborating with a Latin artist. We recall the Prince of Bel Air star releasing Fiesta remix featuring Bomba Estéreo in 2015. Check out below how Will, Bad Bunny and Marc get down in the music video.